Western Ukraine, at that time already inhabited by Slavic peoples, became part of the Kiev Rus (empire) in the 10th century, and was converted to Christianity by the Greek-Orthodox Church. In the 11 th century, Ukraine was united under the powerful King Jaroslav the Wise and linked by marriage to many Western and Northern European royal families. As a result of the division of the Kiev Empire, West Ukraine came under Galician-Volynian rule, with Haiych as its capital. In the 12th century, these rulers succeeded in extending their empire to the Black Sea and to the mouth of the Danube. Prince Danylo was the most renowned of these; he was crowned king in 1253 by an envoy of the Pope. This medieval Christian culture in Eastern Europe is still visible in the chronicle of Galician-Volynian history from the 13th century and in the richly illustrated Haiych Gospel dating from the 14th century. 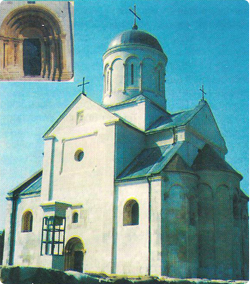 The restored 12th century "St. Pantelimon" church near Haiych is a further monument to this period, one of 30 churches belonging to the princes' residence (see picture right). 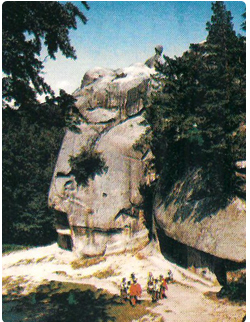 To commemorate the anniversary of 1100 years since the foundation of Haiych, the national park "Historic Haiych" was opened (see above) and a monument was erected to King Danylo in 1998. With these historical monuments, the Ukrainians proudly document their European tradition of over 1000 years, for it is not only in the geographical sense that their country is part of Europe. This independent cultural and religious development in Eastern Europe was brought to an end by the sudden Mongol invasion. The princes of the divided Kiev Empire were now only permitted to govern under Mongol rule. In 1259, King Danylo was orderec by a Mongol general to burn down the wooden military fortress which had been recently completed. In continua conflict with the Mongols, later Tatars, Ukraine lost its powerful position. 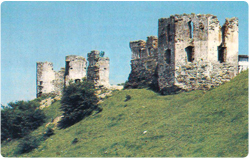 In the second half of the 14th century. Galicia joined forces with the Polish-Lithuanian Empire. This marked the beginning of the strong influence oi Western and Central Europe on Ukraine in the economic, cultural and intellectual-clerical sphere. This influence was to last 600 years, until World War II. In order to proteci the people from continual attack from the warring Turks Tatars and Valaks (from present-day Rumania), the Pol¬ish rulers built more than 50 castles with the help of Wes European stonemasons between 14th and 17th centu¬ries. 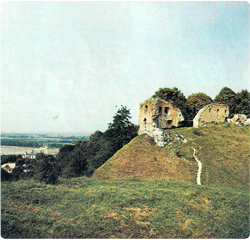 Today, the ruins of the 14th century "Starostynsky1 fortress (see picture right) can still be seen nearby mo¬dern-day Halych still stand. "Starostynsky" is reputed tc have been attacked 29 times by the Tatars between the vears 1590 and 1633. 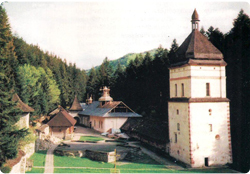 The largest fortress in the Pre-Carpathians was Pniv (see picture below) dating from the 16th century. Its impressive ruins stand 2km south-west of Nadvirna. The Polish-Lithuanian rulers and nobles encou¬raged Polish farmers to settle in the thinly populated land and founded towns and villages. The Ukrainian population remained, but their ruling class looked towards Poland. It adopted the Polish language and the Bishops of the Orthodox Church placed themselves under control of the Pope in Rome. In these centuries, Jews and Germans played a very important role in this orientation westwards, determining trade, banking and economic develop¬ment to a considerable degree. Alongside the emergence of wealthy towns, of which Kolomyia and Nadvirna are notable examples, a period of rapid construction of Christian churches and monasteries began. Not far from Nadvirna stands the fortress-like monastery "Skyt Manyavsky", built in 1611, which is well worth visiting (see picture above). After its destruction in 1676 by the Turks, its subsequent reconstruction and neglect in the 18th and 19th century, it is now being restored to its former glory by monks of the Ukrainian-Orthodox Church. The increasing wealth of the titled families and merchants stood in stark contrast to the poverty of many people in the towns and country. Not far from Yaremcha, the Dovbush cave commemorates Oleksa Dovbush (1700-1745) (see picture below), a popular figure from Ukrainian folklore. He was the leader of a group of rebels who robbed the rich of money and possessions on the highways and gave to the poor, like Robin Hood. Following the decline of the Polish Empire, western Ukraine became part of Austria in 1772, under its old name Galicia, and remained under Austrian rule for the next 150 years. No one was dispossessed or deported during this period, but the German influence increased. This influence was particularly marked during the Empress Maria Theresa's and her son Josef ll's rule, when there was a large influx of German farming families together with a certain degree of industrial development. 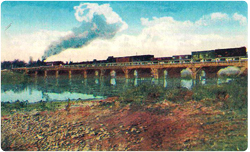 Railway lines (see picture) and representative stations were built.The glass industry and the centuries-old salt-mining gave way to industrial developments including oil and gas mining, rural machine-building, wood, paper and food industry. National movements in Western and Central Europe also fuelled the will to achieve political independence in Western Ukraine. 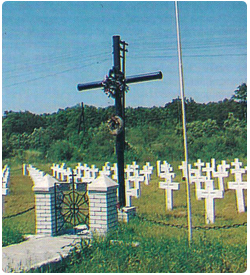 During World War I (1914-1918) Ukrainians had to fight with the Austrians and Germans as well as the Russians (see picture below: military graveyard near Ivano-Frankivsk with Ukrainian, austrian, russian and german soldiers). The end of the war saw the foundation of a West Ukrainian Re¬public with Lviv as capital, which was to last for only a few months, followed by a brief period of Ukrainian independence. However, in 1919 Western Ukraine again came under Polish rule in Poland's victorius war against the Soviet Union. At that time, Galicia was still а country in which many peoples lived together peacefully. 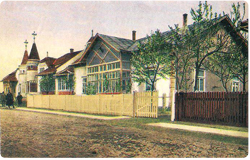 A statistic dating from 1939 shows that of ' the 5,8 million people living in the once more Polish-controlled Galicia 64% were Ukrainians, around 25% Poles, : 10% Jews and 1% Germans (see | picture right: former German set¬tlement, Mariahilf, near Kolomyia). After the outbreak of World War II in October 1939, Galicia came under control of the Soviet Union in the Hitler-Stalin pact. Hard times followed. In the winter of 1939/40 practically the entire German population left the country. The ensuing 5 war years saw the population of western Ukraine undergo radical change. More than 2 million people lost their lives: those deported under Soviet rule, Jews murdered under German rule and soldiers and civilians killed during the German-Soviet war from 1941 to 1944. Hundreds of thousands of men and women fell in the Ukrainian battle for independence which also raged during those years, in which Ukrainians fought against German troops until 1944 and against Soviet troops until 1952. After 1945, the Soviet Union forced the large Polish minority numbering 1,5 million to leave western Ukraine. And many Ukrainian families in turn moved from Poland in Western Ukraine. The graveyards and memorials situated all over this region offer an incomplete at times confusing testimony to the great loss of life which the people in this country had to endure, at times in the fight for freedom and independence, but for the most part as the result of criminal and blinded politics. 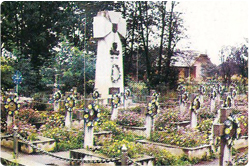 In graveyards from World War I, soldiers of the Austro-Hungarian and the German army, as well as Ukrainian soldiers of the Austrian and the Russian army lie buried side by side. 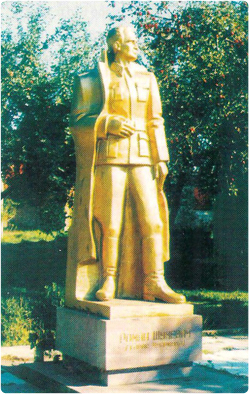 World War II left a legacy of mass graves of soldiers of the Soviet and the German army, including graves of Ukrainians who fought on the Soviet or German side; after 1945 more graves followed from the post-war battles until 1952 between the Ukrainian Insurgent and the Soviet Army soldiers. 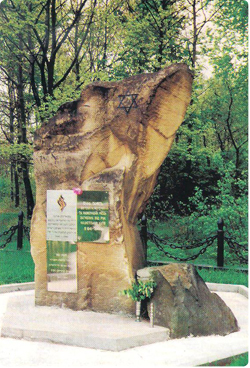 Memorials to the more than 100,000 Jews who were murdered in Ivano-Frankivsk region alone are still few and far between (see picture above). It is no simple task for Ukraine to embrace as part of its own history the conflicts of the past. Again and again, Ukrainians found themselves at the mercy of greater powers and had to pay with their lives. Now, however, they are seeking reconciliation in the hope of securing an European future and the past is no longer suppressed or concealed but made visible as integrated part of their own history. This was demonstrated by the recent unveiling of a plaque by the local authorities at secondary school no. 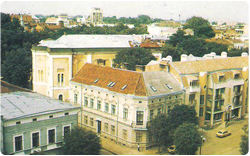 11 in Ivano-Frankivsk. 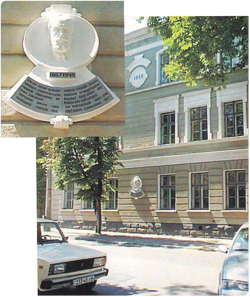 The plaque is in memory of Bishop Dr. Zockler who founded this German school as an elementary school and grammar school (see picture below). 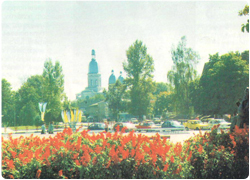 Kolomyia, today with a population of 65,000, was first mentioned in 1241 as a border fortress within the Kiev Empire. The Mongol invasions caused widespread destruction, however after West Ukraine was conquered by Poland in the 14lh century, the country underwent a period of development through its new orientation towards Europe. 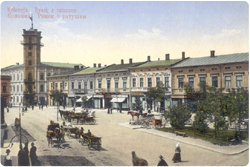 The introduction of city law, modelled on the German town of Magdeburg, in towns such as Kolomyia and Ivano-Frankivsk secured freedoms for the citizens and supported the craftsmen and traders. The town of Nadvirna, founded 1580, experienced a similar development, being situated likewise on one of the large trade routes which led from Central Europe and Poland via Galicia to Kiev and the Black Sea. It was along these routes that goods from Romania, Hungary and Turkey reached as far as Western Europe. Rich salt deposits, the sale of furs, honey and horses constituted one of the chief attractions for Western merchants. The markets, which lasted for several weeks and were held twice a year, were highpoints in the lives of these towns. At these times, the town of Kolomyia, above all its market square, would be packed with up to 300 traders' carts. They offered their goods and in turn purchased local products. In Kolomyia alone, 150 bakers provided bread for the countless traders, craftsmen and visitors. These towns, wealthy by medieval standards, also fell victim to military assaults and pillaging by Turks, Tartars and Walachs. 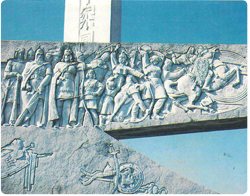 In 1492, Kolomyia was completely destroyed during one of these assaults. The town's many fortresses and strongholds were not able to prevent the Turks and Tartars from burning it down 7 times in the course of the 16th century. Every time, a part of the population was captured and taken into slavery. Nadvirna was not built until the end of this terrible century and, protected by the Pniv fortress, it was to a great extent spared these attacks. The treatment of those taken into slavery was very different. Nastja Lisowska, from the village of Rogatyn situated north of Ivano-Frankivsk, was captured by the Turks in 1520 and sold to Sultan Suleymann II the Magnificent. As one of his favourite wives, she gained under the name of Roksolana such great influence upon Turkish politics between 1520 and 1550 that she was able to free many Galicians from slavery. Today Roksolana is celebrated as a folk heroine in Ukrainian history books, and a smart hotel in Ivano-Frankivsk and a pleasant local vodka are named after her. Economic development in the following centuries was greatly influenced by the wealthy Jews who came from Western Europe and by Polish immigrants. 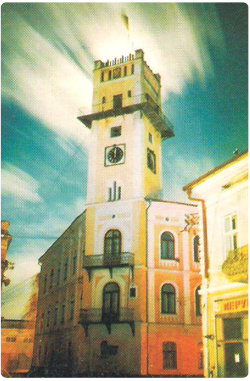 In the towns of Kolomyia, Nadvirna and Ivano-Frankivsk, the population in 1939 was approximately 40% Jewish and 30% Polish. In contrast, more than 75% of the rural population was Ukrainian. Before their emigration in 1939, approximately 50.000 Germans lived in Galicia.